https://www.forrich.net watch video Igor Mazepa. Whether you have a traditionally looking loan or modernly stylized garden or even the most creative and outgoing backyard decorations, the new stunning solar water features will work all day round, 24/7, for seven days per week and throughout the whole year round in order to bring a spectacular and most outrageous look and feeling to your household. Why Have Solar Powered Water Features? Solar powered water features represent to you all the benefits of ordinary water features, but also bring great advantages. Solar power doesn’t need any electrical wires to transmit the energy to the device, therefore solar powered water features come without the wires. And since no wiring is required, you have a great advantage of freedom of movement and replacement. You can choose to place your solar feature anywhere in your backyard, where you would like. Don’t forget also about your terrace, upper floor of your home and even balconies. Solar powered water features do not have to be an outdoor decoration, they can be installed anywhere, where they can get sunlight. And when the old location will seem boring, inconvenient or not appropriate anymore, you can easily replace it and put it into the other place, since there are no wires that tie the feature to a particular place. If you decided to improve the look of your own garden with the help of solar powered water features, there are lots of options for you. You can add a waterfall or fountain to bring harmony to your beloved little garden or loan area. However, costs are the biggest deterrents in deciding on the question whether you should or should not have a water feature in your garden. With solar powered water feature you will be able to save money on monthly electrical costs; this is quite a strong reason in favor of investing into solar powered water features for your garden. Besides solar powered water features are 100% environmentally friendly, therefore you not only make your garden look better, but also help to preserve our environment. The UK manufacturer Water Features offers a great variety of water features, both small and large in size, with additional installations or in singular segments. 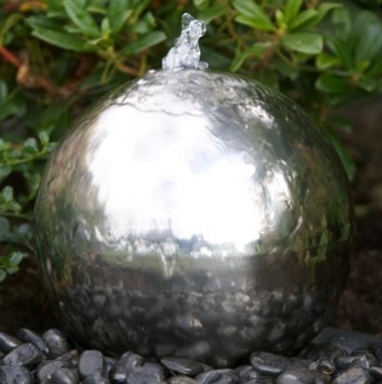 Among the offered products one can find 30cm Solar Powered Stainless Steel Sphere Water Feature, Antique Brown Embossed Cascade Solar Water Feature, Buddha Fountain Solar Water Feature with LED Lights, Century Birdbath Solar Water Feature and many other. As well as distributor of garden features Garden4Less.co.uk can offer a variety of fountains, such as Falmouth Single Tier Solar Powered Water Fountain or Stepped Slate Fountain, and many more, to satisfy your desires.